More often than not, rick folk get a hard time on film. If they’re not the victims of hideous crimes (including house break ins, kidnapping, murders, etc), then they’re being portrayed as snobs who have no feelings and care about nothing more than moolah, and how to make more of it. Stereotypes are so lazy, and really shouldn’t be re-enforced on film. However, we can all make an exception as far as rich people are concerned, so long may it continue. French director Amanda Sthers, who also wrote this feature, has created the perfect playground for her rich characters to indulge in, as well as display how totally self absorbed they all are. Listen, you better keep on laughing, as no other bugger will. Paris, the city of love. It’s also the perfect place to go and act all snooty, a bit like the French themselves. 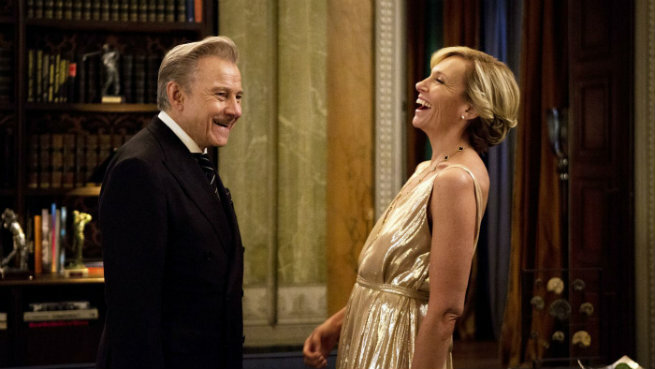 So that’s what American couple Anne (Toni Collette) and Bob (Harvey Keitel) are doing, living the snooty dream in Paris. Anne has organised a dinner soiree, but with the unexpected arrival of her son Steven (Tom Hughes), the guest number has now reached unlucky thirteen. To literally even out the numbers, Anne insists that her maid Maria (Rossy de Palma) join them, but she must pretend that she’s a friend of hers. During the dinner one of their guests, David (Michael Smiley), becomes smitten with Maria, much to the chagrin of Anne. He is keen to see her again, and although Anne is against it, she struggles with the other option of David finding out the truth and the embarrassment that would inevitably come from it. But love is a two way street, and Maria finds herself falling for David’s Irish charms, which only annoys her employer even further. I thought we both agreed to wear hats! I just look ridiculous now. As you would expect from this type of film, Maria represents the proletariat, and therefore the true heroine of the piece. This tag is reinforced by the sheer ugliness of Anne and her kind. The problem is, there’s just too much ugliness on show here. Collette’s Anne is so self-obsessed that she’s rotten to the core. She’s not evil as such – it would certainly have been a far more enthralling watch if she were – just annoyingly unpleasant. And she’s not alone, with pretty much the entire cast – with the exception of Maria’s character – being on the unlikable side. Of course there’s nothing wrong with irritating characters, as long as they have entertaining things to do or/and say. Unfortunately Sthers’ script is as flat as a crepe, and lacks any kind of bite. The only appeal for Collette and Keitel to sign up must have been the allure of shooting in Paris, as there’s nothing on screen to suggest otherwise. The only sympathetic character is Maria, who de Palma plays to perfection. It’s just a shame that everyone else on screen comes across as two dimensional and caricatures of real people. To that end, the film is clichéd and dated, offering nothing substantial to enrich your viewing experience.